How to Fix "Your Connection is Not Private" Error in Google Chrome? Home Android Fixes How to Fix “Your Connection is Not Private” Error in Google Chrome? Getting “Your Connection is Not Private” Hurdle along your Browsing?? Well, it’s really an annoying error or warning alert usually encountered in Google Chrome Browser. We know how it feels when you are browsing a normal website and suddenly get through this error. This error takes away the full page, stops you from accessing what you aimed for and gives you a full page description of what went wrong. You see a Warning message “Your connection is not private, attackers might be trying to steal your information“. 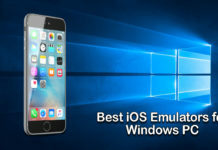 There are many cases in which you may notice this warning but in this Guide, you are going to get a final fix for this error in Windows, MAC or Android. You can easily get rid from this error yourself. This error page is built up mainly for Google Chrome Browser. In other browser, the error may look something else. But the given solutions (fixes) can help fix Your connection is not private error in any of the internet browser, whether it’s Windows 10, Mac or Android Browser. Let’s checkout the causes of this warning error. It is always good if you know the reason behind any of the error you face. It takes you one step further in fixing the error. 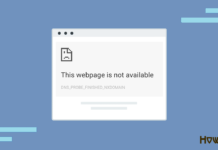 Your Connection is Not Private Error Page usually appear when there is any issue with your Network, System, Browser or from the site itself. Let’s see each cause in details. Incorrect System Date and Time: If your Computer Date and Time is Set Incorrectly or if the time is running behind the actual time then the error “Your connection is not private” pops-up while you browse any website in Google Chrome. It comes up with the error code “NET::ERR_CERT_DATE_INVALID” or “Your clock is behind” or “Your clock is ahead”. Invalid Browser Caches and Cookies: You can fix this issue directly by clearing Browser Caches and Cookies. 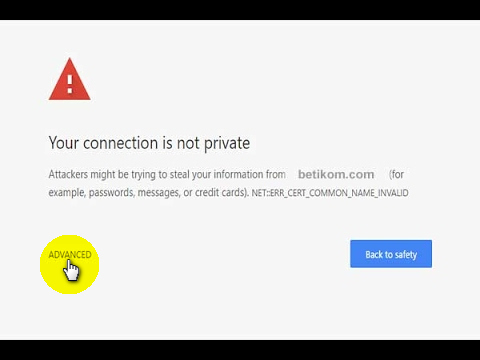 Antivirus Blocking Insecure SSL Connection: If you are using any antivirus then it may interfere while you are browsing non-SSL website. Check for Faulty Extensions or Plugins: If you are using Extensions in your Google Chrome then they may be interfering in Browsing a Website. We can check the culprit by disabling them one by one. 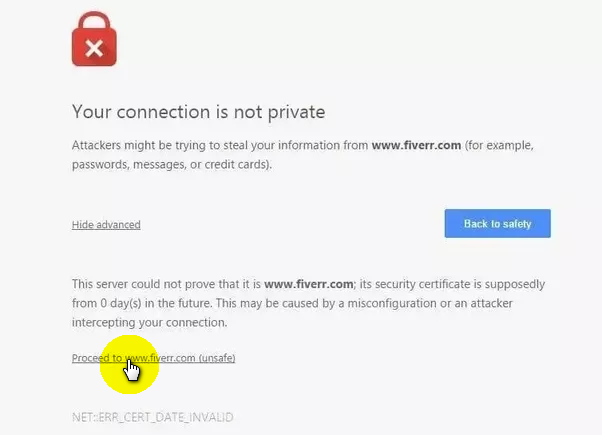 Expired SSL Certificate: This is the problem from the Website. You can’t do much about it. So these were few of the reasons why you may be noticing Your connection is not private error. Well, these codes also helps you find the main cause of the Warning Your connection is not private. Let’s checkout how to fix these errors. Since we now know the reasons behind this error, we can easily solve it. Here we have got 4 to 5 tips or fixes which you can follow one by one. Note that you don’t have to follow them all, you just start following starting from top to bottom and see which fix works for you. Most of the times, this warning page with the title Your connection is not private comes with an option to directly bypass the page or error. So if you are sure enough or if you feel that the landing page (website) you are visiting is safe then you can skip this warning page. Step – 1: Read the full warning page and at the bottom, you will find “Advance” named button. Just click on it. Step – 2: The description box will expand and you will see more details of the warning and why you are seeing this page. Again at the bottom, you will find an option saying “Proceed to www.website.com (unsafe)“. Click on it and you will be served the actual version the website. This way, you can skip the warning / error page in google chrome browser and access your desired website quickly. But make note that this is unsafe method, if you are frequently getting this error page then certainly there is some issue from the website side or from your side. So you may follow the next fixes for the permanent solution. CHECKOUT – How to Fix “Driver Power State Failure” Error in Windows 10? 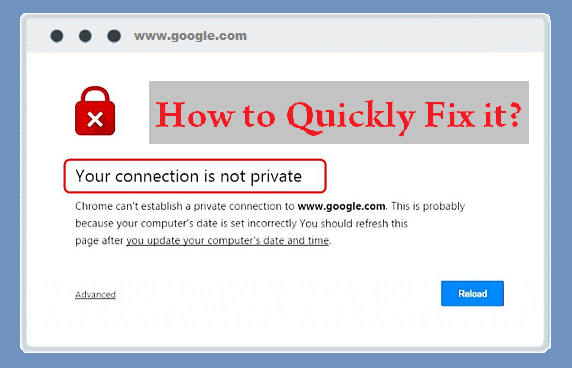 If your System Date and Time is incorrectly set, lagging behind or moving ahead of the actual time then Google Chrome may show you Your connection is not private Warning Page. In order to fix it, you have to set the time and date correctly. Don’t worry, it’s easy and works in matter of second. 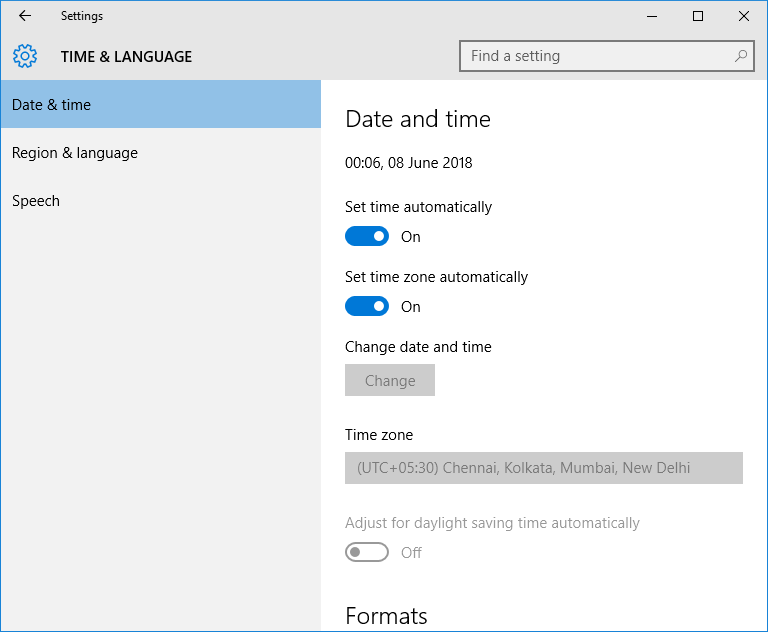 Step – 1: Right click on your System Date and Time (situated at the right side under task bar) and select Adjust date/time option. Step – 2: Make sure you turn on the Set time automatically or Set time zone automatically options. Alternate: You can manually set date and time and select your time zone. But make sure you set it to the actual current time and your actual time zone. If not yet, then carry on trying next fixes. ALSO CHECK – How to Get Netflix Free Trial without Credit Card? Step – 1: Launch your Google Chrome Browser in your Computer. Step – 2: Copy and Paste “chrome://settings/clearBrowserData” in the search bar and Press Enter. 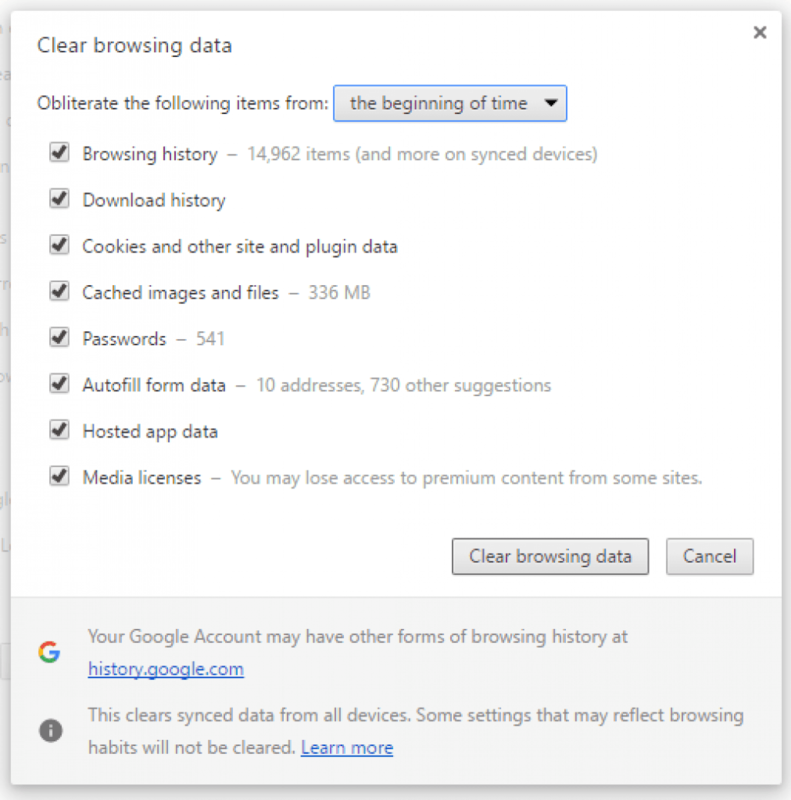 Step – 3: A “Clear Browsing Data” box will popup. Select “the beginning of time” and check all check-boxes. Step – 4: Finally, click on Clear browsing data button. That’s It!. You have cleared all your Browsing History, Cache & Cookies. It’s time to test this fix. Check for the “Your connection is not private” Warning page. It would have vanished, most probably. Are you using any Antivirus or Firewall? If yes, then they may be culprit for this error. Antivirus have special privileges or access and they can be the hurdle while you surf. Some of the antiviruses, by default, terminate the access to the non-secure website (no SSL websites) thinking for the users safety. But what if you feel the website is really risk-free and safe. In that case, you can turn off the Scan SSL Setting in your Antivirus. 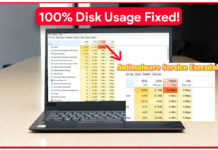 Antivirus settings differ from Software to Software and Version to Version. You just have to manually check the browsing settings of your Antivirus and enable the access to non-SSL websites or turn off the SSL Scan. If you are unable to find the correct settings then just Disable the Antivirus temporarily and try to surf the website. If you are able to visit the website without Your connection is not private warning then that means your Antivirus is indulging. You should check and make the proper settings in your Antivirus. Same like Antivirus, there may be some issues with the Plugins or Extensions that are loaded or working in your Chrome Browser. Some extensions like VPN tend to be responsible for such errors or warning. In such cases, you can try disabling them or finding the alternate. Let’s see how to find the culprit extension in your Google Chrome Browser. 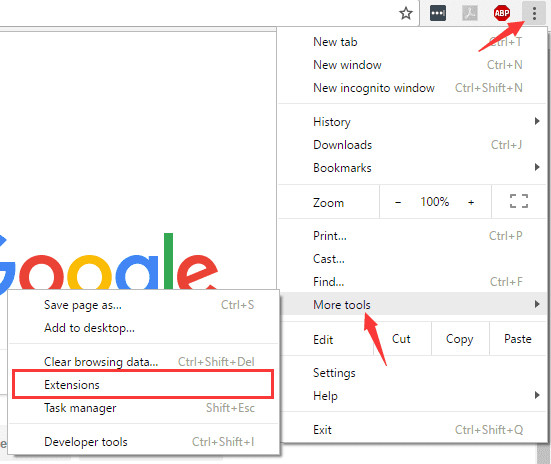 Step – 1: Navigate the Control Menu on your Google Chrome Browser and Select “More Tools” Option and then Click on Extensions. All the available browser extensions are displayed on the page. Step – 2: Now simply Disable the extension by unchecking the checkbox available infront of Enable option and check for the “Your connection is not private” warning page. Same way, check other extensions and find out the faulty extension which is causing this error. You can then Re-Enable the non-faulty extensions. In more simpler words – Disable one extension, check for the error, if it still appears then that means the extension you disabled was not causing the error. So you can re-enable it. Now disable another extension from the remaining ones. And check the error. Same way keep doing it until you find the extension causing this issue. If you find any extension not working or causing the issue then simply Remove or Disable it in Order to fix this Error permanently. Try visiting the websote with HTTP and/or HTTPS (try both). If none of the given fixes work then you are the issue is from the website you are trying to surf. In that case, you can contact the administrator or the webmaster of that website to check for the issues and fix them. If the website you are trying to surf has got SSL issues like Invalid SSL Certificate or Expired SSL Certificate then ask the owner to get the new working SSL. If you are facing this issue on your own website then you need to get your SSL fixed. You can check if the SSL needs to be renewed or the errors with the SSL Redirections. ALSO READ – How to Use PS4 Controller on PC? So we saw total 5 working fixes for fixing or bypassing a Google Chrome Warning page with name “Your connection is not private“. Most probably, you will get rid from this error right after trying the first solution. In most of the cases, the problem is from the Antivirus or Browser Side. If you get through any other fix then do let us know. Also, if you are finding anything difficult to follow or facing any other issues then feel free to discuss in the comments below. That’s all for this guide. Thank you!